Colleges and universities can be contacted today with the help of our pre-built list of college emails and contact directory! Buy a college email database containing direct emails, phone numbers, and more and get in touch with administrators and decision-makers in higher education now! Find college administrators, professors, department heads, and key decision-makers with the help of this university email database. Colleges and universities, public and private, have a lot of influence, not only on their students, but on their communities. To start talking to the key points of contact at numerous higher education institutions, simply download this verified university email list. College mailing lists like this rarely double as directories of non-generic email addresses, as well as accurate phone directories. With one organized university mailing list from Bookyourdata.com, you can get in touch with your target audience in many different ways, as it includes all of the important contact information: emails, phone numbers, addresses, titles, and more. Our college email list can be pulled right into your CRM. 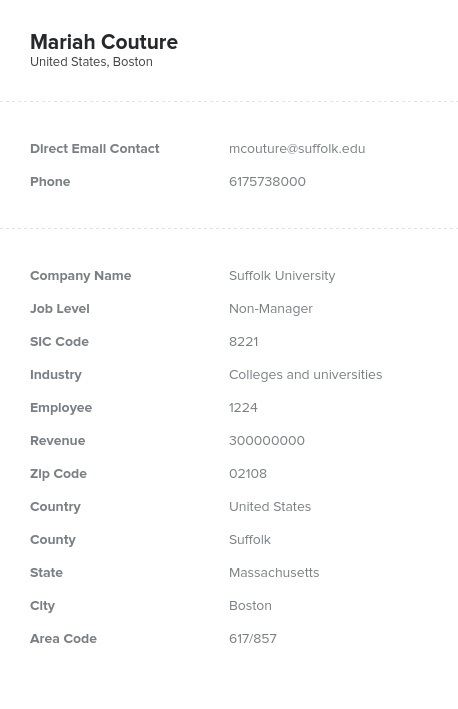 With Bookyourdata.com's university email address list, you can find the highly qualified people who would be most interested in your product and start marketing to them right away. In a few minutes, use this college email address list to call or email leads who are influential with the group your business needs to reach. This affordable college mailing list is for those looking to market their product or service to colleges and universities, whether that item be synthetic turf for a stadium, a new line of textbooks, research equipment, or something else that's relevant to those in higher education. Our premium mailing list for colleges enables you to directly contact professors and administrators who may be interested in your product. Download it and start connecting with your target B2B audience: professionals working at a university or college. Mail list options can also be crafted by using our build-a-list tool. Build your own, customized list of targeted sales leads or purchase this ready-to-download data product now!